Wake up and drink 20 oz. water. Drink water throughout the day! Every 60 minutes, take 5 minutes and walk or stretch. Block your work into 4 hours maximum. Work on the highest priority things that have to get done that day only. Ever wondered how others maintain high performance throughout the day? Here’s my routine, inspired by my Achievement Accelerator coach Brendon Burchard. Set triggers / tapping exercises; 2x/day my phone goes off to trigger my mind on specific values of integrity, kindness, being present, etc. High Performers have uncommon clarity about three things: (a) who they are, (b) what they desire and, (c.) how they intend to perform and interact with other people. By knowing these things, they can stay true to themselves, in their zone, and highly intentional. Without clarity, there is no way you can reach high performance. With clarity you are focused and limitless. High Performers experience and generate heightened and sustained levels of energy through training, discipline and focus. You can literally feel their energy because they’ve become present, vibrant and strong through their choices, nutrition, and conditioning. High Performers are more likely than others to speak up for themselves and to take more risks and bolder actions. They are intentionally courageous, knowing that their decisions and actions are forming a character that is either weak or strong. Their courage helps them get ahead because, when everyone else quits at the first signs of criticism or difficulty or risk, they march on. High Performers simply produce more in the same amount of time as everybody else. They get into experiences deeper than others, and they become more efficient and prolific as well. That’s why they get ahead faster. How do they become more productive? They have more clarity, energy and courage! High Performers have better people skills; they give others more time, attention and caring, and as a result, other people admire, respect and help them. Their kindness and generosity draws people in, and often helps them be elevated to leadership positions. They simply tend to be exceptionally caring, good, fully contributing human beings. The most important lesson I’ve learned is that High Performers are not born; they are conditioned by habit and practice. Sharpen, heighten and hone these five areas of High Performance and you will start to experience what we call The Charged Life! 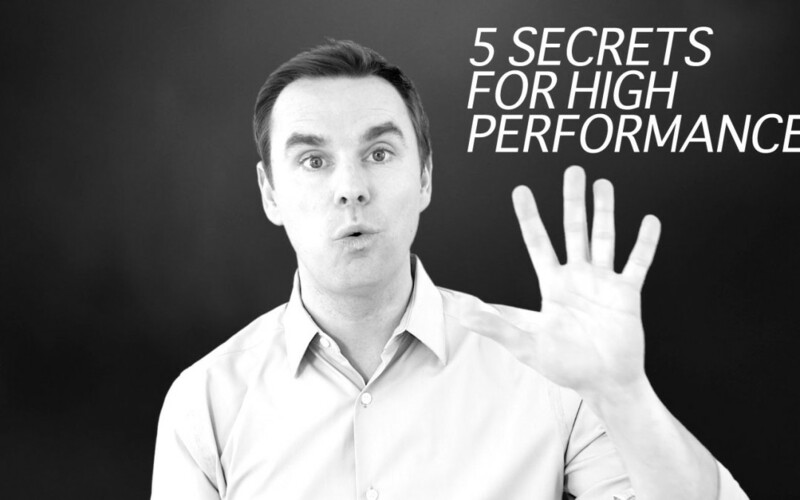 I know you guys see me quoted all the time as “High Performance Coach – Brendon Burchard,” But what the heck does that mean? Well, I’ve spent 19 years researching and working and coaching people through this topic because I just feel like isn’t that what we all want? We all want to become our best at whatever we’re doing and we want to become our best over a short period of time. And then of course, what’s at the bottom or the next part of every peak—a valley, a drop. We want heightened and sustained performance and potential in our life. We want it to be heightened, we want to sustain it. That’s what we call high performance. As a sort of text book definition we could say it means, in our personal lives, succeeding and excelling over the long term above standard norms. That means we do better than we usually would for a long period of time. We maintain the energy, the vibe, the flow, the zone; whatever you call it. What they meant was they hit high performance that season. That was the season when they were excelling beyond what they normally did. And they maintained it. And those times in our lives are AMAZING, right? Have you ever had a time at work when you really hit your stride? Where you really hit high performance? It seems like you were being more productive than you usually were. More productive than even your teammates or may be even your supervisor were. You were just like, you were like in the flow; you were on for a period of time. I don’t mean just a day or a week. I mean you were really on it for a couple of months or maybe even a year or two. That’s when you hit high performance. My quest has been to figure out, what happened in that year or two for you or what happened in that season for the athlete so they can grasp it again, so they can get it back? My whole career is ultimately about figuring that out. If you read all my books, it’s always trying to figure out, how do we draw from ourselves, the greatest amount of energy, engagement, enthusiasm we can; so we can experience what we call The Charged Life? And I feel like if we experience The Charged Life enough that’s when we hit high performance in all areas of our life. That’s when we feel like, it’s just our relationships are vibing and going really well. Our career is vibing and going really well … our hobbies, our passion. Now, it would be a little bit crazy to think all those things could always be perfect and that’s not what I’m after at all. I’m not after perfection. I’m after excellence. I’m after, how can we all achieve our best but keep at that level? Where instead of a life where it’s ups and downs and ups and downs and ups and downs for so many people, that’s not what we’re after. When an Olympic athlete hires me or a fortune 50 CEO hires me, the reason they do it, is because they know I’m going to get them up here, I’m going to keep them up there. Because they can’t afford, in the marketplace to have ups and downs. Their sponsors don’t like when they have lots of wins and losses. They hit peak performance in a game but the next game they fall back down. How do we keep them up there? 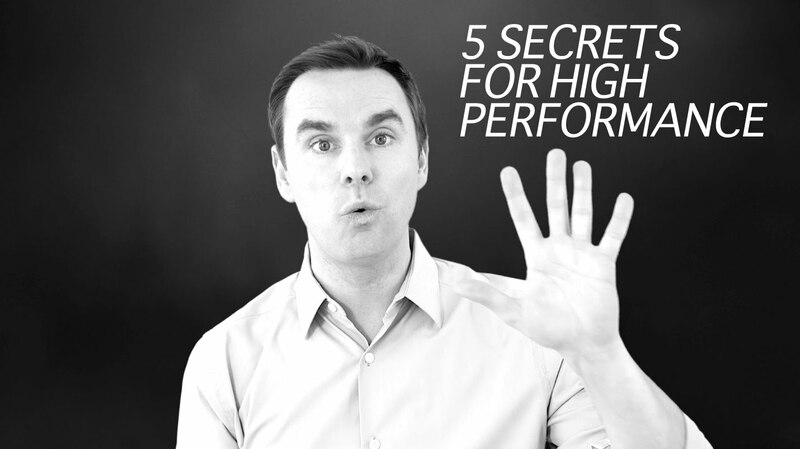 There’s basically five qualities of high performance. It’s that people who are high performing in any area, they got these five things going on for them. And if we can just get you to that point where we maintain those five things then we could call you a high performer no matter what you’re doing. And so what’s the first one? 1. The first quality of high performance or a high performer is Clarity. They’ve got just an uncommon amount of clarity about who they are, what they’re seeking to do or achieve or experience. They’ve got a heightened quality about what their interaction should be with other people. It just, they’re very-very-very focused. They get in their clear about who they are. About what they are after. How they should be interacting with other people. They know what they are about. They know what the game is. To focus on what’s important. All that comes from clarity and without clarity there’s no way we can ever reach high performance in our lives. 2. And the second thing that we know for sure is there’s heightened and sustained levels of energy. High performers have more energy. A high performing athlete has more energy than one who is dull in it. We know that. There’s a physical vitality, a mental stamina too that goes along with their days. That the energy, it’s palpable, you can feel it around them. And of course, it’s not luck; they’re generating that energy. They’re conditioning that energy in their body by their training regimen. They’re conditioning their energy in their mental stamina by having the clarity of what to focus on, what not to focus on and getting very disciplined about where they give their time, energy, effort, attention. So, they’re not pulled in a million different places because you know how it is. If you’re pulled in a million different places or you’re multi-tasking dozens and dozens of things, you’re kind of, your energy it’s dissipated. Theirs is extraordinarily focused and powered up with reserves. 3. The third thing that we see is a heightened level of courage. To take bold action and risks than other people. They’re more willing to speak up for themselves, take action and take risks than other people. And that’s why they tend to get ahead a little bit better than other people because so many other people are paralyzed with the analysis paralysis. They’re scared about what to do. They’re unwilling to take that risk that might just give them that extra edge. To put their ideas out there. To express who they truly are with the world. To say no to things that aren’t on their path or of their passion. To stick to their purpose. Even when the whole world is judging them or pushing them, they stay the course. They have the courage to stay the course. And because they do that they outperform everybody else who gave up or quit when they got judged or when it was too hard or who were too scared to take the action. So, we have to look at people’s courage to see how they’re doing in their life. 4. The next thing we know, the fourth element of high performance is Productivity. High performers just produce more. If you look at a high performing athlete, they’re putting in more hours on the field. If you look at a high performing executive, they’re more efficient and effective with their time than their counterparts. It’s just, it seems in the same amount of time they get more done, or they get into the experience deeper or they’re more efficient or effective at it. And because they are, obviously they’re able to get ahead faster than other people. But we have to look at that in our own lives. How productive have you been in this last couple of weeks? Be honest about it. Because it’s going to dictate whether or not you’re going to ever reach your full potential. Isn’t it true? Productivity has so much to do with our full potential? You look at even an artist. A lot of artists are judged based on how prolific they were. Were they productive in their careers? Did they put out one painting or were they like Monet? Did they put out one musical arrangement or were they Beethoven? Were they thinking of one formula or were they solving all formulas like Einstein? There’s something about a high-performer in any area that they just get more done partially because they stay at it, partially because of clarity, energy and courage. So, honestly evaluating ourselves in that area is vital. A lot of the work I do with senior executives comes back down to reclaiming their life, reclaiming their day. If you read The Motivation Manifesto, you saw declaration number two is Reclaim Your Agenda. Get your life’s agenda back. Get your life back on track. Take back control, discover what you truly want and start moving towards that with greater boldness, effectiveness and efficiency and life changes. 5. Last one, high performers have a greater level of Influence. They have greater people skills. They’re just kind of good with other people because they give other people time, attention, respect, honor. And by caring about other people deeply, they tend to get what they want too because other people see them as compassionate and kind, so they reciprocate. And because they have high levels of ability to give and to take and to be with other people in influential ways to lead other people, to be a good role model for other people, other people admire and respect them. So they help them, they join their team, they cheer them on, they support them, they invest in them. Because frankly, they tend to be exceptionally caring, good, contributing people. Now, is it possible for all of us to become high performers? Are high performers born or made? I’ve worked with a lot of people like I mentioned even major celebrities or music stars, they might not have ever even thought consciously about clarity, energy, courage, productivity and influence but you look at their lives, and those elements are there. And they’re sharpened and they are honed. They’re sharpened they’re honed because they focused on their life. They’re mastering their mind, their emotions, their schedule. They focus on the discipline of creating real knowledge, skills, talent, abilities and they’ve done it longer than anyone else and so those areas; they got sharpened even if just by luck and habit. My job is to ask questions of our clients to help them find greater levels of power in each of those areas. That’s what makes me a High Performance Coach. I hope that this has helped you kind of explain what the heck it is I do. What the heck it is so many Certified High Performance Coaches do out there in the world. And I hope that someday you consider yourself a high performer or you make it a life’s goal to help people reach higher performance. You can check out my websites or visit us at High Performance Academy at some point in your life and we’ll talk about it there and that’s where people get certified and learn about how to become a High Performance Coach. Well that’s what I do. I hope that by just talking about this you evaluated your life a little bit more closely in those five areas of high performance. Get good at those five areas and tell you what? You’ll start to experience what we call The Charged Life.